Control the lighting, audio, video, security and over all ambiance from anywhere. A typical home has many systems in it. These can include whole house music, intercom, distributed video, networking, security, lighting control, heating and cooling systems, cameras, pool and spa control, gate control, and so on. A home automation system ties all of these systems together so you can interface with them from one point of contact. With custom programming, you can automate all kinds of things to make your life simpler and make your home a safer place. For example, custom programming can allow events to happen contingent upon other events. A fire code from the alarm system can cause the home automation system to tell the lighting system to flash your exterior lights so your home is easy for emergency personnel to find. The fun of custom programming comes when you are ready to relax or entertain and pressing one button starts a whole sequence of events: for instance, setting lighting scenes, starting music in the appropriate rooms, and telling landscape lights to stay on late since you’re having a party. A complete home automation system includes and communicates with all of the subsystems mentioned above. Any single subsystem can operate independently in a well-designed automation system. By using wireless touch panels, wall mounted touch panels or keypads, and even iPhone or iTouch, you tell your home automation system how to control all of your subsystems. We are Good at This! Designing an automation system that meets your needs is a process of discovering how you will use your home and what is important to you. 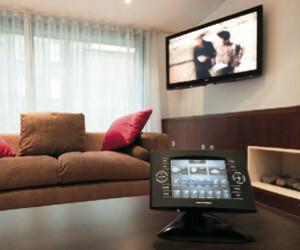 Electronic Integration was one of the very first companies to venture into home automation. We have over 18 years of experience working with systems from the early primitive ones to today’s most sophisticated designs to help you find what is right for you. A very popular subsystem of home automation is Whole House Entertainment. Whole House Entertainment is a term that has evolved from the desire for a deeper home entertainment experience, which is now made possible by video and audio technology advances combined with an explosion of available programming content. People now love being at home. Electronic Integration imaginatively translates your lifestyle and home details into the incredible universe of media technology to provide the final accent to your home. Whether it is home theater, or room independent audio and video, or complete smart-home automation, Electronic Integration professionally integrates all of the components into a seamless elegance for your home.